Venezuela's President Nicolás Maduro has said he wants a million more people to join his civilian militia by the end of the year. The call to expand the militia - which answers directly to Mr Maduro - comes as opposition leader Juan Guaidó seeks to persuade the Venezuelan military to abandon the president. So far the military has stayed loyal. US-backed Mr Guaidó declared himself acting president on 23 January, saying Mr Maduro's 2018 election was flawed. According to the BBC's Americas regional editor Candace Piette, Mr Maduro's call to increase the militia numbers will be seen as an attempt to shield himself further both politically and physically. 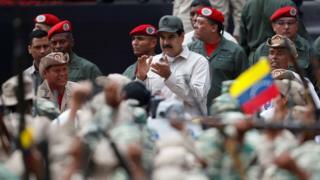 The president praised the civilian militia for its readiness to "defend, with arms in hand, (the) peace, sovereignty, territorial integrity and independence and the life of our homeland", during a rally in the capital, Caracas. But he also called on the existing two million members to get involved in agriculture, as Venezuela continues to struggle with a spiralling economic crisis which has left people struggling to afford food. Is there a new cult of personality in Venezuela? "With your rifles on your shoulders, be ready to defend the fatherland and dig the furrow to plant the seeds to produce food for the community, for the people," Mr Maduro told the crowd of militia members. Mr Guaidó, meanwhile, called on people to take to the streets to "start the final phase of the end of the usurpation". He told an anti-government rally in the capital they needed to redouble efforts to oust Mr Maduro from office. Mr Guaidó blames Mr Maduro for the skyrocketing hyperinflation, power cuts and shortages of food and medicine which have crippled the country in recent years. Mr Maduro blames the US. Why are Maduro and Guaidó in conflict? They each claim to be the constitutional president of Venezuela. Shortly after Mr Guaidó declared himself interim leader, his assets were frozen and the Supreme Court, dominated by government loyalists, placed a travel ban on him. 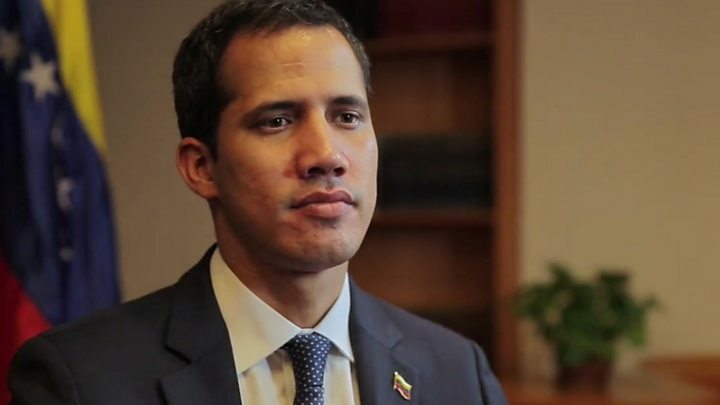 Media captionJuan Guaidó speaking to the BBC earlier this month: "We want genuinely free elections"
But the 35-year-old opposition leader defied that ban last month when he toured Latin American countries to garner support. Mr Guaidó has continued to call for President Maduro to step aside and has urged the security forces, which have mainly been loyal to the government, to switch sides. Juan Guaidó: Is there a new cult of personality in Venezuela?